Here at our location at Donley Ford Lincoln of Ashland, we always make time to help our customers and other drivers to properly configure their vehicles. While many modern vehicles are delivered to their drivers ready to go, many of these cars also allow for the addition of towing related accessories. To this end, it can pay for prospective vehicle owners who plan to do a lot of towing in the future to know a little bit about the main towing styles. These styles include 5th-wheel towing, gooseneck towing, and conventional towing. Prospective vehicle owners who plan to do heavy duty construction or commercial hauling may be well served by 5th-wheel towing mounts. These types of mounts are usually reserved for heavy duty vehicles, and they often mount within truck beds over the rear suspension areas. 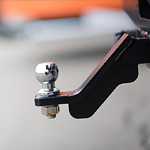 While 5th-wheel towing can offer drivers comfortable rides and additional capabilities, vehicle operators should note that the use of such a system may require the installation of specialized kingpins. Gooseneck trailer towing has much in common with 5th-wheel towing in that the trailer mounts appear within the truck beds. That said, gooseneck towing setups do not require kingpins as they use specialized couplers and balls for physical connections. Conventional towing setups are the ubiquitous ball and hitch connections that are commonly seen on passenger cars, pickup trucks, and SUVs. While these types of hitches are common, drivers should note that each vehicle and hitch will have different weight bearing capacities.